Contemplating the migration of an application to the cloud or concerned by cloud vendor lock in and the risk associated with limited fluidity of infrastructure? Google and Puppet have collaborated on a project to bring Google Compute Platform infrastructure management support to the Puppet ecosystem. Puppet's mature automation solution was built on the concept of separating the definition of an application's configuration from the actual implementation so making it more portable. 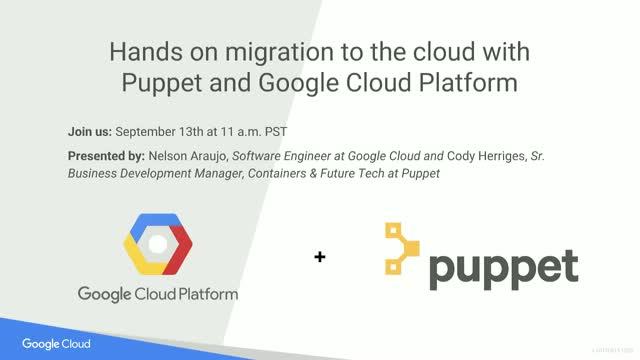 Together we will present how the GCP collaboration can be used along side Puppet Enterprise to enable and reduce the friction associated with migrating a common web architecture and software across public cloud providers. - Understand how Puppet Enterprise and its configuration language can be used to accelerate cloud migration. - View Puppet Enterprises' reporting capabilities and how it'll increase an organization's confidence of success. - Be informed on Google's continued effort to build open source tools that make operations' lives better and establish a more open internet.